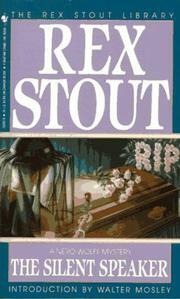 Nero Wolfe returning after some six years, with as spectacular and gaudy flim-flams, obnoxious behavior as pre-war. Directing the high strategy involved in the murder of Cheney Boone, head of the Bureau of Price Regulation, he controls public opinion in his handling of the case as he lets the National Industrial Association stew while he works out the solution. A second killing, the disappearance of Boone's last dictated message, and Wolfe, with the omnipresent Archie, and Cranmer (who has been kicked downstairs) is ready to pounce. Current topics and trends are a part of this wily Wolfe yarn.